In 2002, Oringer opened Uni in the lounge of Clio; a sashimi bar offering the freshest seafood from Tokyo’s Tskuji market as well as local fisherman. 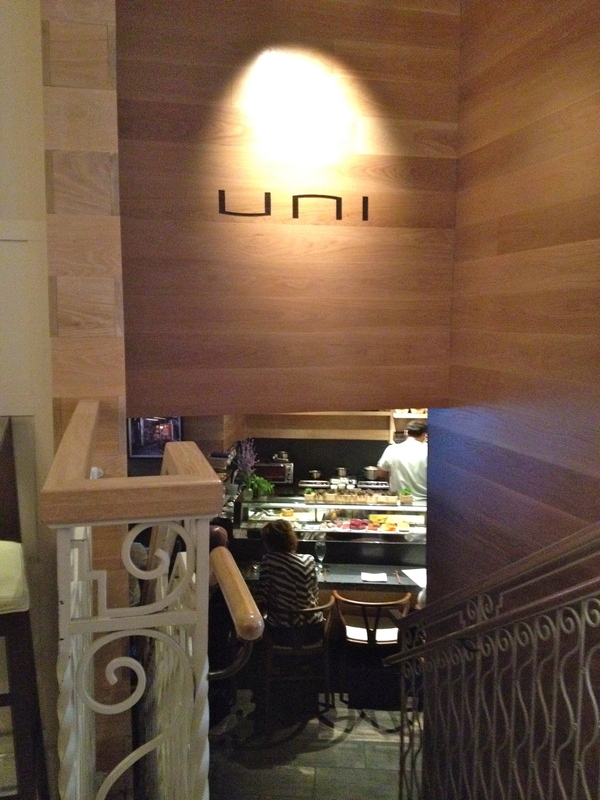 Uni earned four stars from The Boston Herald and in 2008 was selected “Best Sushi Bar” by Boston Magazine. We’d done the tasting once before… many years ago, well before the boy was born (who is now 7). So I was beyond excited when I found out we were going again… the previous tasting menu we experienced there was quite possibly my all time favorite meal. Yes, it was that good. 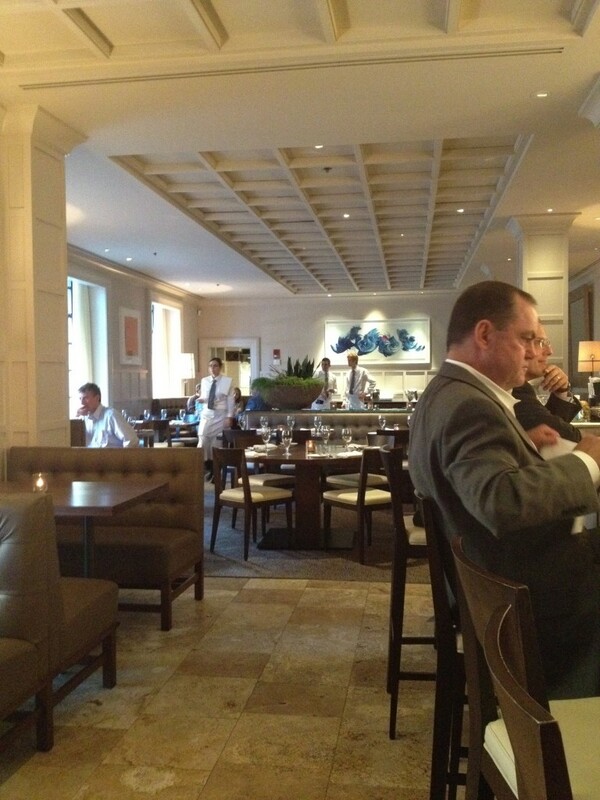 It abuts the restaurant’s main dining area and has a nice, light, airy feel to it. 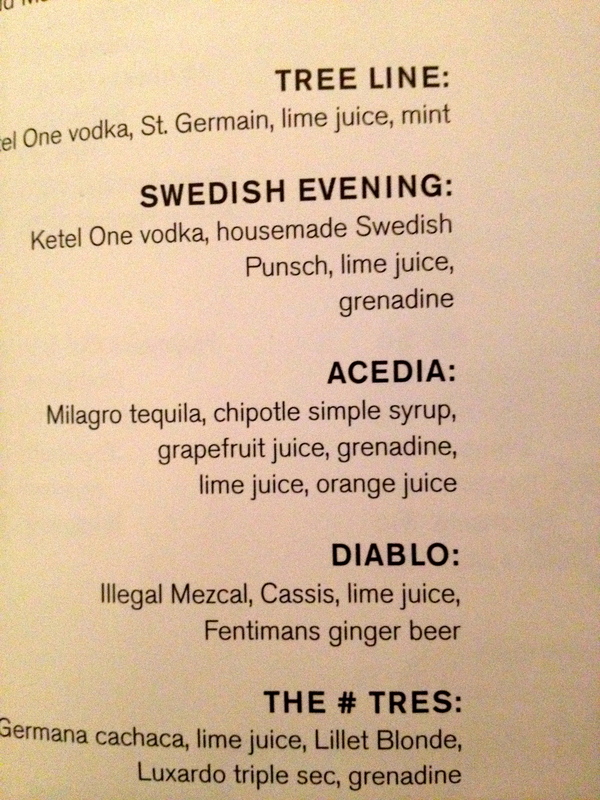 The cocktail menu is superb. It’s several pages long and each page looked as good as the next… chock full of interesting concoctions that the bar staff has creatively put together. 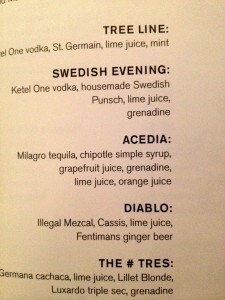 Dan started with the Acedia, an interesting mix of Milagro tequila, chipotle simple syrup, grapefruit juice, grenadine, lime juice and orange juice. 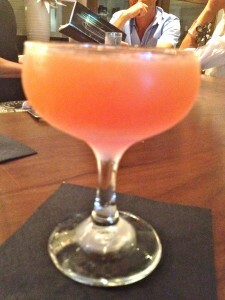 It was a nice tropical mix with a little chipotle kick at the end. He really liked it… I’m not a fan of chipotle, so I didn’t love it, but the underlying flavors were really nice. 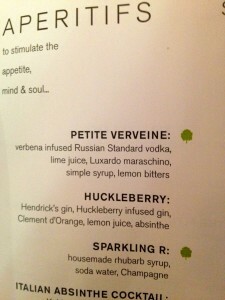 Now MY drink on the other hand… was fabulous! 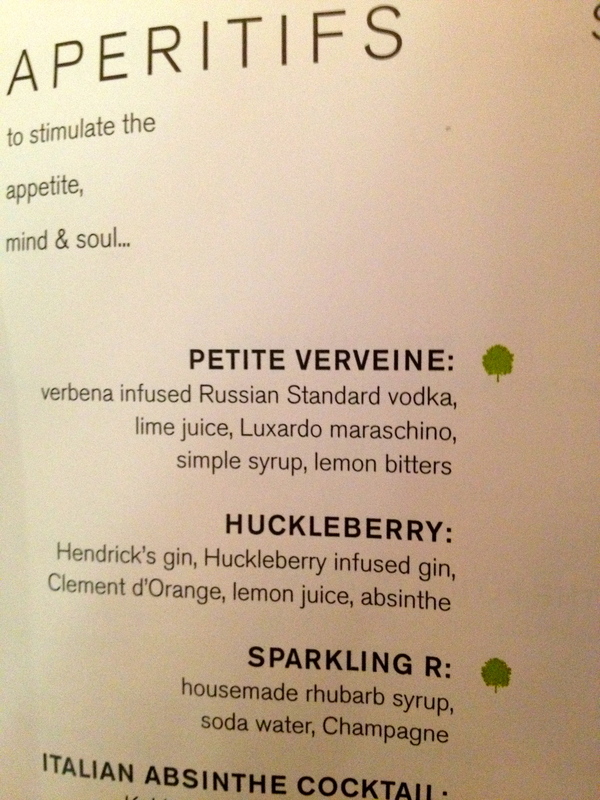 There were so many drinks to chose from, that I forced myself to pick a drink from the FIRST page… and even picked the very first drink… the Petite Verveine. 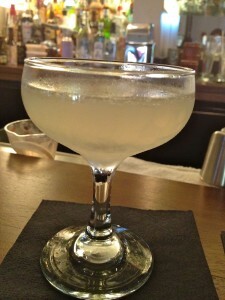 It was an intoxicating mix of lemon verbena-infused Russian Sandard vodka, lime juice, Luxardo maraschino liquor, simple syrup and lemon bitters. It was fantastic. Refreshing, summery, crisp. I loved it. In addition to Clio, Ken Oringer has strategically placed a high-end sushi bar in the lower floor of the restaurant… and needless to say, many of the dishes are inspired by Japanese sushi techniques and ingredients. 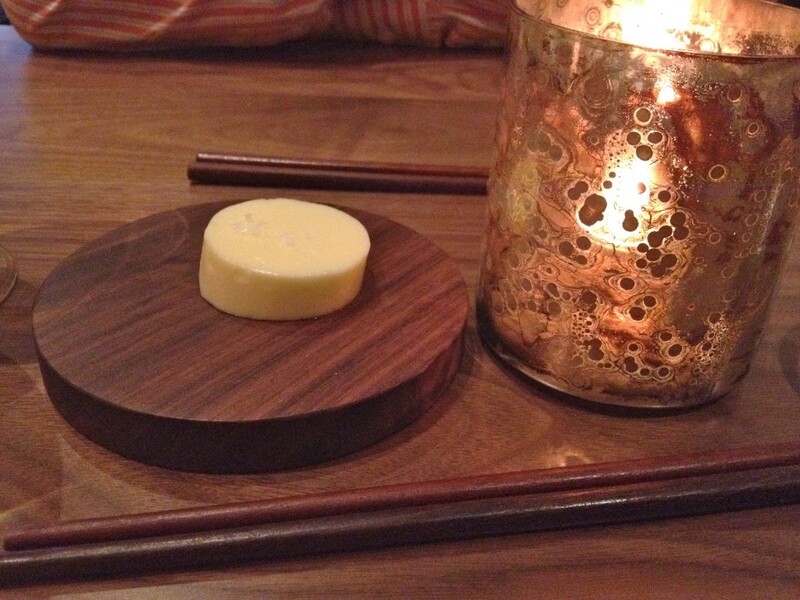 Even the tables are adorned with the simple lines of Asian design… such as this round teak wood butter dish and chop sticks. We looked at the menu, looked at each other… I gave that “oh please can we get the tasting menu look” and before I knew it… we had ordered the 10-course menu and our amuse bouche had arrived. I really, really wish that I could tell you what this was exactly… but alas, I can’t. 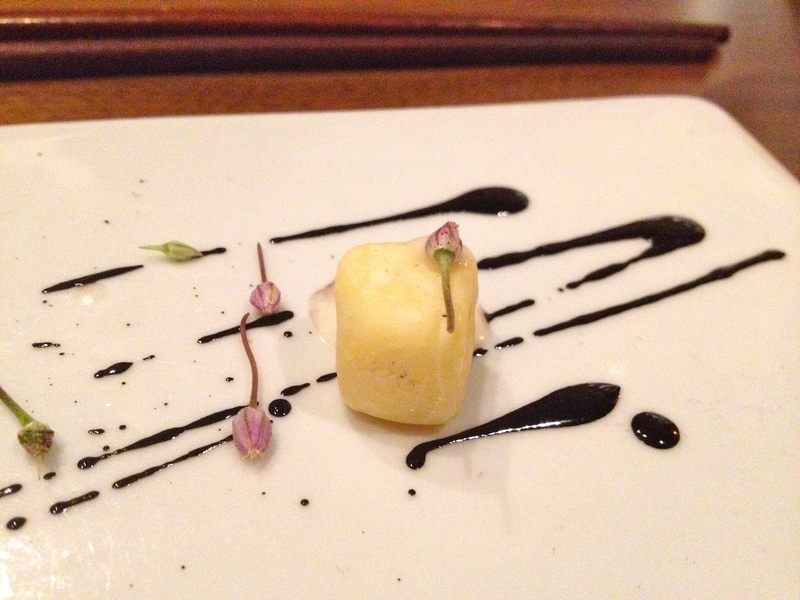 What I CAN tell you is that it was a little white chocolate cube, filled with a semi-liquid center that was a savory combination of some type of interesting root gel (I want to say lotus). IT WAS AMAZING. 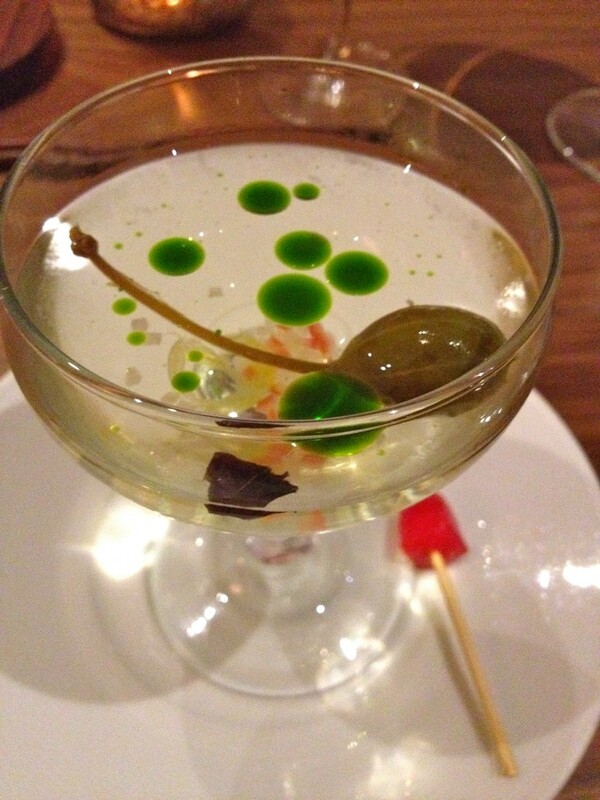 The first course was a Tomato Water Martini — served with Caper Berry, Tom Olive, Jicama and a Tomato Popsicle. Um… DELISH. I *am* a sucker for tomato water though. The dish descriptions were graciously provided to me by the restaurant manager, Seth. They don’t however, include every itsy-bitsy ingredient… but I wish they did! For example, I’m pretty certain that’s basil oil on top. The same is true for the remaining courses as well.. but you get the idea. 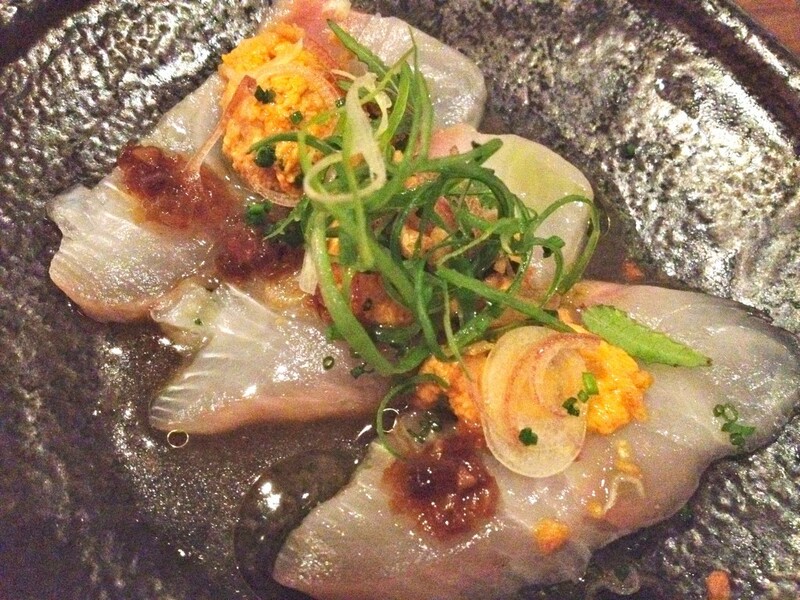 Next up, Kampachi Sashimi (Amberjack, Hawaii) — with Maine Sea Urchin, Yellow Chive, Myoga. Clearly lots more ingredients here… but alas, no idea what they are! This dish was superb… the flavor combination of the sweet fish, salty uni (sea urchin) and everything else was like a flavor explosion in your mouth. See that one tiny green leaf in the bottom right area? Those little things were crazy good! They were little herbs that had a unique flavor and almost left your mouth tingly and numb after… I couldn’t get enough. 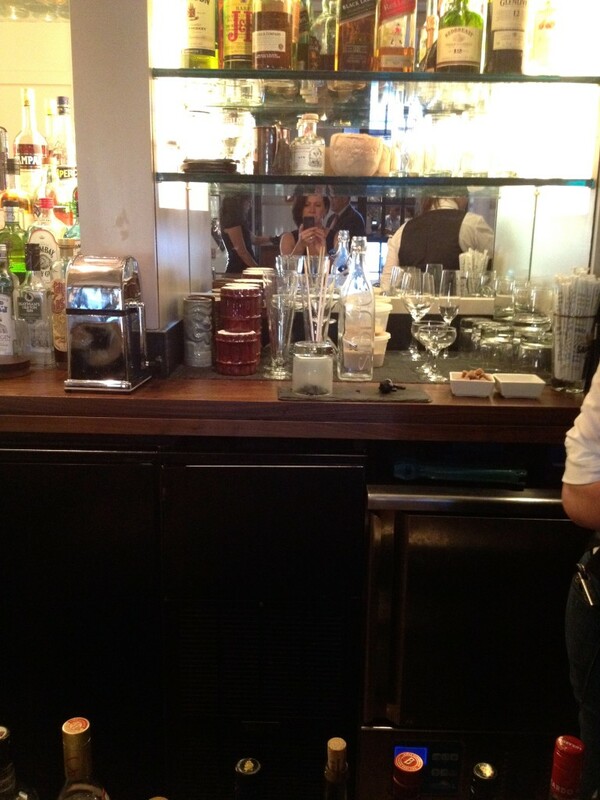 It was a great sensory experience! Island Creek Oysters — with Angelica Root Mignonette, Chive Blossom, Grains of Paradise and Osetra Caviar came out next. 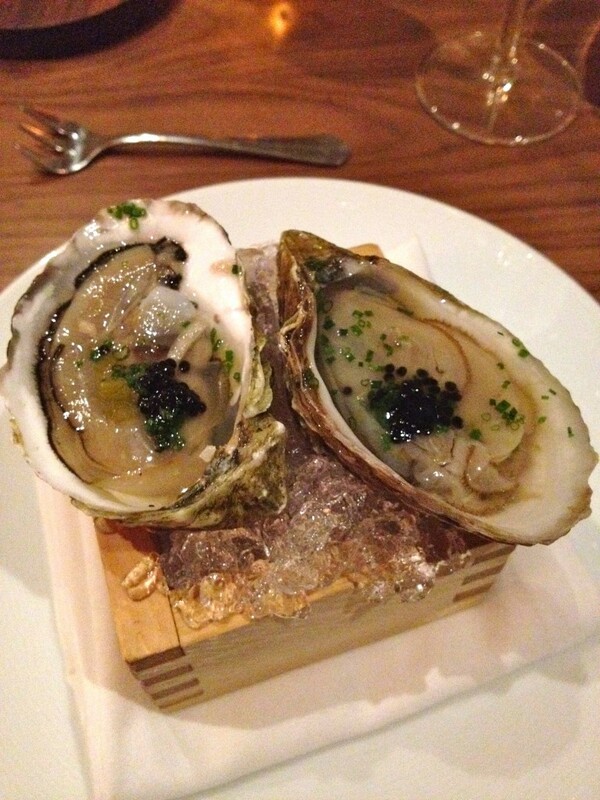 I love, love, love raw oysters… so there was nothing not to like about this dish. The caviar added a nice salty bite to the sweet and briny oysters, which were amazingly fresh. 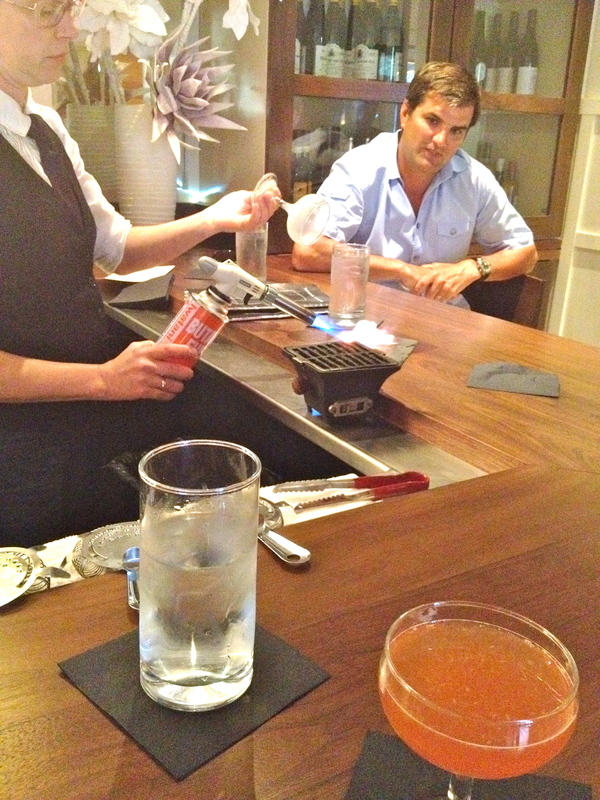 I loved the presentation as well… they were sitting atop a wooden sake box filled with shaved ice. Stunning. The presentation for the next dish takes the cake though… the Strawberry Gazpacho — with Pickled Green Strawberry, Boquerones, Olive Oil and Hibiscus was a drool worthy picture before we even know what it was! The dish arrived with all the soup components and it was beautiful. Again, there were more ingredients than listed… including a little rolled up anchovy filet. 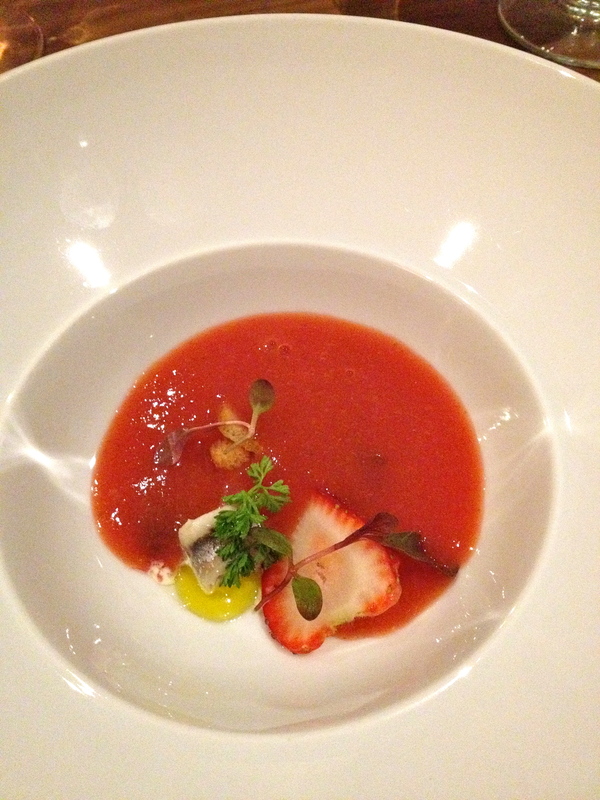 The gazpacho was poured over the components to finish the dish. The flavor combinations were ridiculous… sweet, savory, salty, bitter… all rolled into one. I loved this dish. It was served at room temperature and really couldn’t get much better. Very creative. As you can see, the foam sensation is still around! I know a lot of foodies consider this process overdone, but I still love it. It adds such a nice variety of texture to a dish and you have to admit the presentation is stunning! 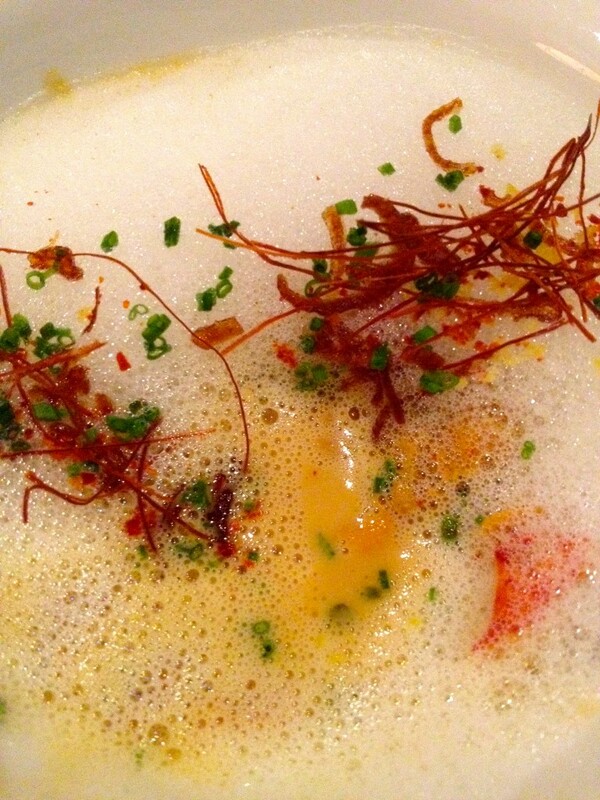 This is a Cassolette — of Lobster, Sea Urchin, Parsnip Milk Emulsion and Chili Threads. The chef obviously is a fan of sea urchin since it shows up a few time on the menu… but that’s okay, I love the savory taste. 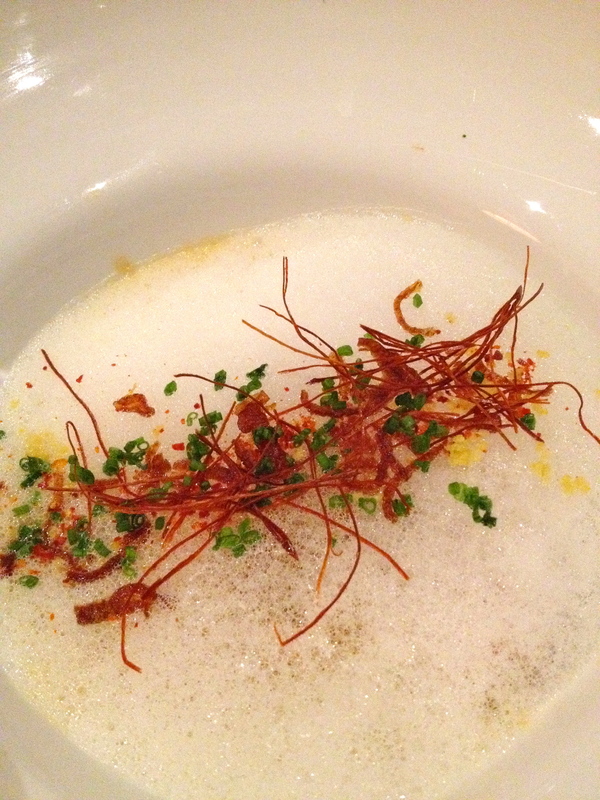 The parsnip foam was covered in those tiny chili threads and finely minced chives. Under the foam was the Pièce de résistance… the lobster and sea urchin. The combination was divine. This was a very decadent, mouth-watering dish. Now the Foie Gras — with Laquée Milk & Honey Coulis, Pickled Rhubarb, Cornichon and Pulled Honey on the other hand was IN.CRE.DI.BLE. Period. I don’t care how full I was.. .I inhaled this amazing dish. 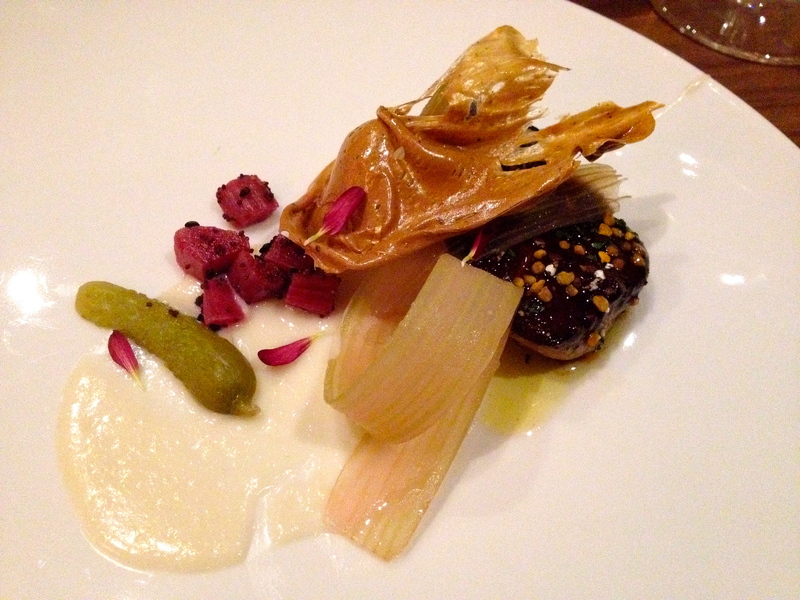 The foie gras was superb, the accompaniments were a perfect flavor combination and the PULLED HONEY was to die for!!! Another “main course” arrived after that! You see, that’s what happens when you try to squeeze in 10 courses!!! 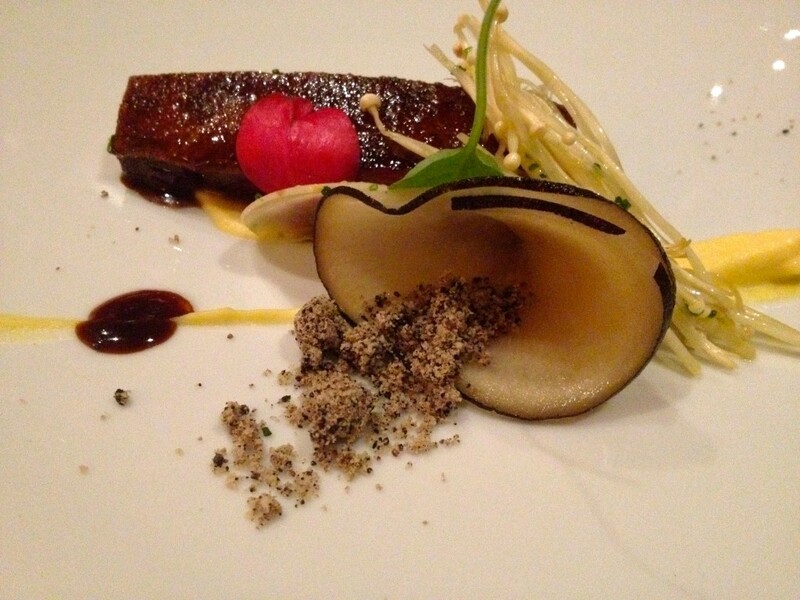 It was Roast Duck — with Black Licorice, Fennel Bulb, Candied Buddha’s Hand and Black Radish. 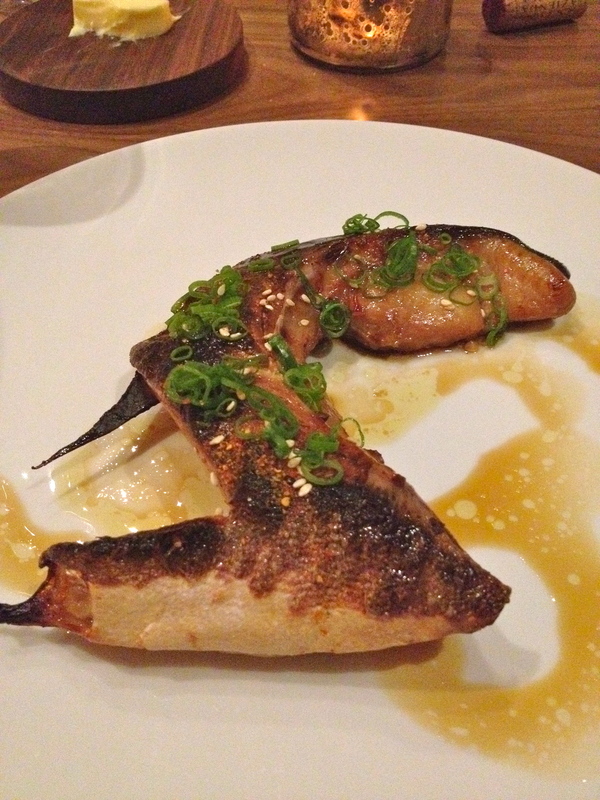 Now, I am not a meat eater… but I didn’t want to be difficult and ask for a different course for me, as Dan loves duck. So I agreed to this ahead of time and boy I was not disappointed! While the duck wasn’t my favorite part of the dish, it was still perfectly cooked (med/rare) and very delicious. Dan absolutely loved it. Truth me told, I only had a few bites because I was obsessed with all the goodies it came with! 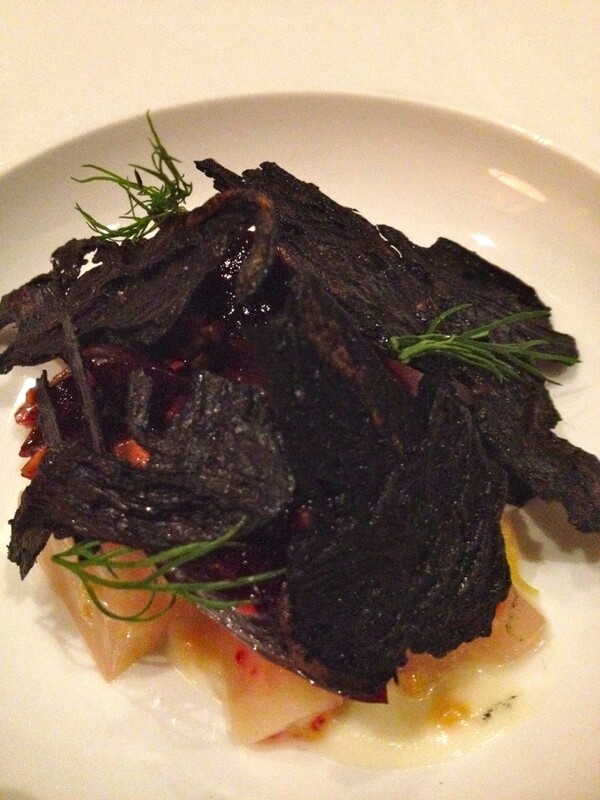 See that granular powder-like stuff that’s in the black radish slice? TO DIE FOR. No idea exactly what it was… I think it probably had some of the candied buddha’s hand and clearly other ingredients… it was such an interesting, sweet mix that it’s very difficult to articulate the flavor. Everything worked perfectly together. At this point, the alcohol started taking it’s toll and totally forgot to take a picture of our 10th course (we actually got EVELEN! )… the Cheese Selection — with Honey, Bacon “Jam”, Armagnac Soaked Golden Raisin… which included Bianca Di Langa (Sheep, Piedmont) and Isle of Mull (Cow, Scotland). What’s not to love about cheese? Not much to say here. Last up was dessert… and we surprisingly were able to eat the entire thing. 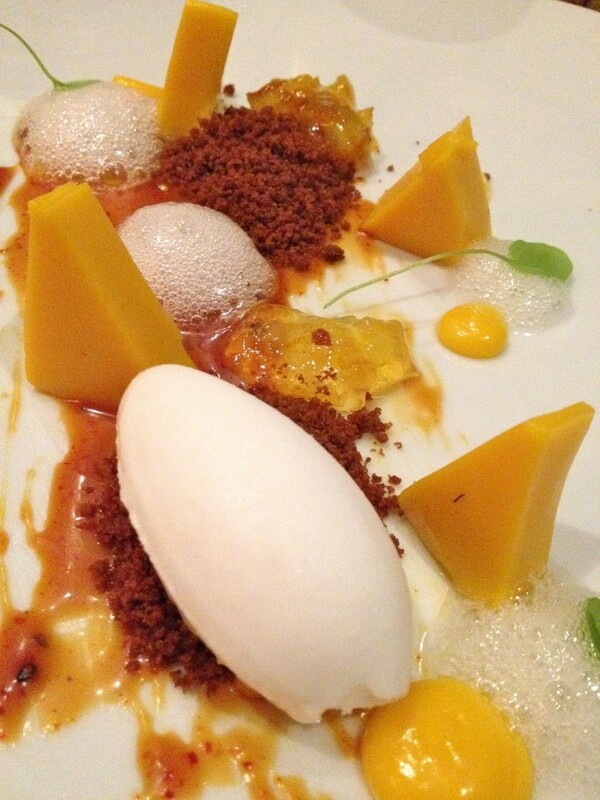 It was a delectable Mango Tart — with Coffee, Togerashi Caramel and Coconut. 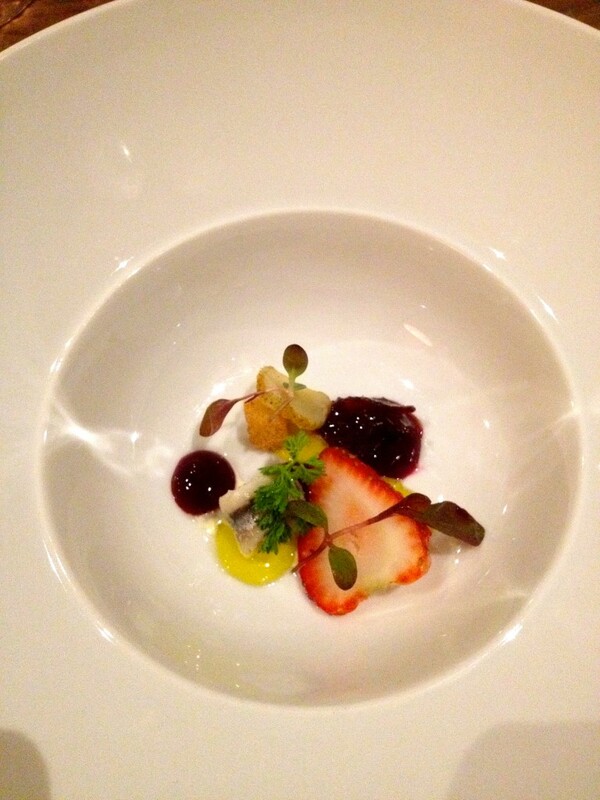 As expected… a stunning presentation with lots of tastes, textures and visually appealing. 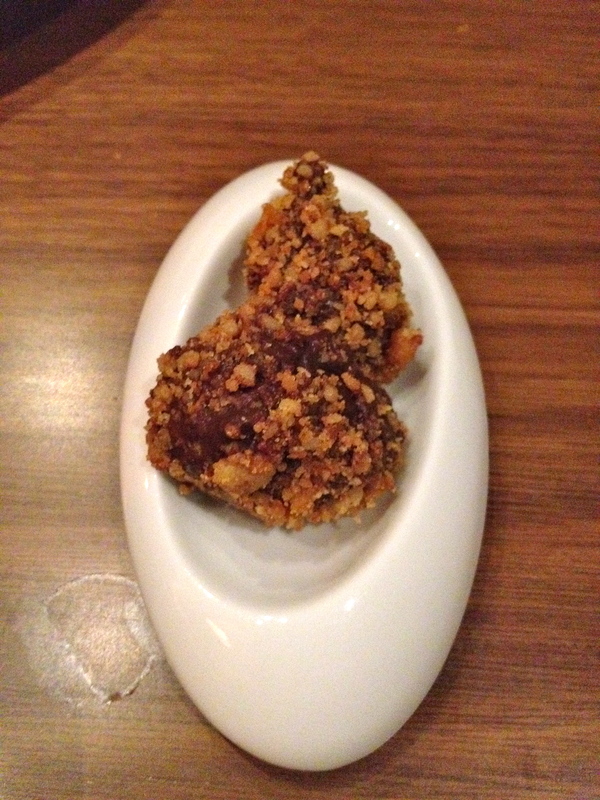 Dessert — technically course 11! As if that wasn’t enough, right before our check arrived we also were presented with these little final bites. YUM! A sweet ending… to help lessen the blow of the final check! Want to see something REALLY scary? Look below. Dan didn’t want me to post it because it IS very embarrassing. How we could spend this kind of money on something you just poop out, lol. But, I think it’s only fair to share these details… as it helps put the quality of the meal into perspective. In our defense… this is NOT a regular thing for us. It’s a once a decade kind of thing. It was a huge splurge celebrating not only my birthday, but also the 1-year anniversary our our shop and the buying of our new house. 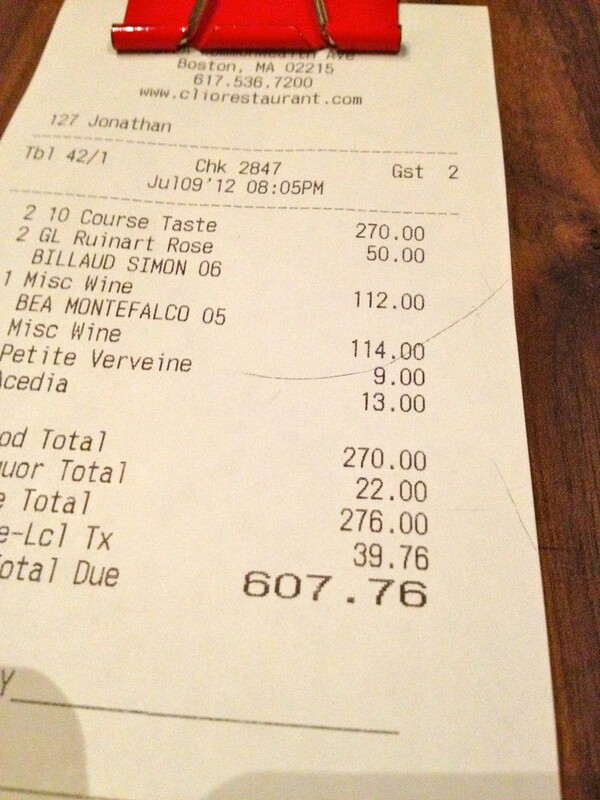 We won’t be eating out again for quite some time… but it sure was worth it!! !